A SHARP rise in feeder cattle prices over the past month has inflated projected losses on grainfed cattle in our latest 100-day grainfed trading budget calculated yesterday. In our third trading budget projection for 2019, our standard set of variables (see list at base of page) has produced a negative $83 result on a typical 450kg flatback feeder steer, entering a Darling Downs feedlot yesterday and closing-out after 105 days on feed in the last week of July. That’s a $19/head worse proposition than this same budget calculation done back on 12 March, when the loss was $64. Contributing most to the slide, feeder prices have shot up 25c/kg since our previous budget, in response to February and March rain across some parts of eastern Australia. We’ve priced our typical heavy flatback feeder ex Downs at 285c/kg for today’s budget, up from 260c/kg a month ago prior to the rain impact. Trading late last week saw feeder prices up to 290-300c/kg in places, but with a few more heavy feeder cattle now starting to present to the market, 285c/kg is a representative figure this week, trade sources say. Given what lies ahead with slaughter cattle supply in coming months, there’s a degree of urgency evident in the market among supply chains keen to put a few feeder cattle away for later in the year. What’s also clearly evident since recent rain is the closure of the disparity between backgrounder and feeder weight cattle prices. During the depths of the drought, lighter backgrounder types were often at a 10-20 percent discount to feeder types, due to the lack of feed resources of all types – including pasture, roughages, hay and supplements. That gap has now closed right up, and backgrounders are again worth similar money, on a cents/kg basis, as heavier feeders. Six weeks ago, there were still plenty of 250kg weaners selling sub-200c for heifers and around 200c for steers, while feeder weight cattle were the best part of 80c/kg more expensive, especially for Angus. It may not be too long before backgrounders restore their historical position as selling at a premium to feeder weights, on a cents/kg basis, some market watchers suggest. At today’s designated heavy feeder purchase price of 285c, it values our steer at $1282, up about $90 a head compared with a month ago. The current feeder price is still 25c/kg behind our December reported feeder price, however. Historically, June represents the annual low-point in feeder prices, but whether normal cycles follow in a year like this is open to question. Offsetting the impact of lower feeder prices, we’ve applied a finished ration price for today’s budget of $485/tonne, down $5/t since last month, but still not that far off our all-time high ration cost of $500/t seen back in August. 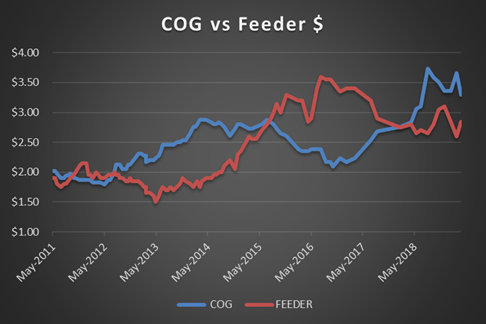 While feedgrain prices ex downs have come back relatively more than that (see recent feedgrain report), roughages, cottonseed and other ration ingredients are still near record highs, helping sustain high mixed ration prices. While wheat ex downs this week can be bought for around $430/t, hay has gone from $500/t to $600/t in recent months – some of it coming from South Australia. 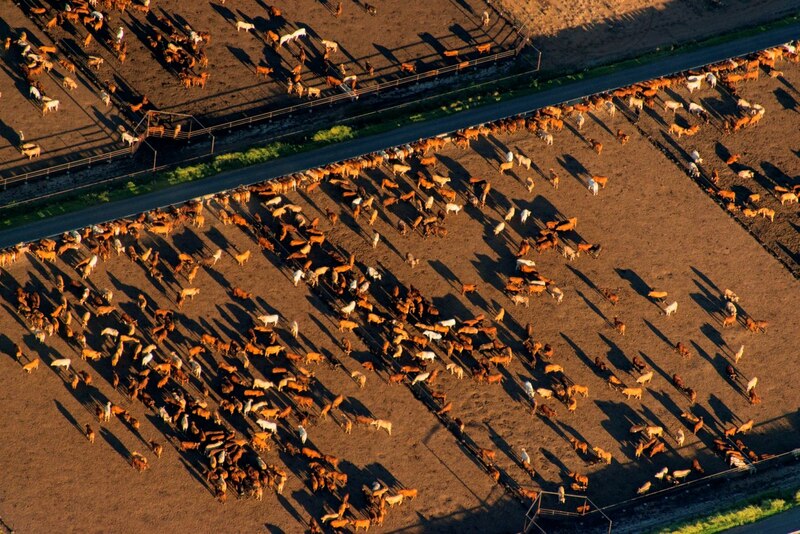 Another factor in sustained high ration prices is the continued high demand for feedlot space. While there’s some evidence of a few pens emptying-out in recent weeks, the lack of follow-up rain since the March rain event is likely to see those vacancies re-fill reasonably smartly, Beef Central was told. While ever industry demand is high for feedlot pen space, there is less compulsion among lotfeeders offering custom feeding services to reduce their margin, helping prop-up ration asking prices. A ration price of $485/t applied in today’s budget delivers a total feeding cost of $760, down $7 a head on last time. Total production cost (including feeder purchase) is $2147, up a little over $100/head compared with mid-March. Cost of gain in today’s calculation is 362c/kg on a steer gaining at our designated 2kg/day, down 4c/kg on last time, but still high in a historical sense. Depending on where the meat market is, the breakeven result still looks pretty ugly, showing a 609c/kg breakeven today based on budgeted performance. That compares with a forward contract 100-day grainfed direct consignment grid price for late July delivery of 585c/kg. The breakeven figure a month ago was considerably lower at 578c/kg. That comparison between today’s breakeven figure and forward contract price delivers an $83 loss per head on this week’s figures, compared with a $64 loss a month ago. Insert a better average daily gain performance into the formula, however (2.2kg/day, as opposed to 2kg/day in our standard calculation) and the loss reduces to just $18/head – close to square. The forward contract grainfed price quoted above has risen 25c/kg carcase weight from 560c/kg this time in March, but it has not been enough to stem the impact of sharply higher feeder steer purchase cost on the budget outcome. With cattle on feed numbers across Australia still well above one million head (March quarter industry survey figures should appear about this time next month), it appears to have allowed processors to keep a lid on grainfed slaughter cattle pricing, to some extent, despite solid international beef demand and favourable currency movements. Will more grainfed cattle suppliers be looking to secure forward contracts in coming months, instead of taking spot price? For the past 12 months, most participants have been optimistic that the meat market has more upside – despite the fact that some big breakeven figures have been seen on grainfed export cattle. But participants know that the market is over-sold, and the opinion in the market is that grainfed processors continue to enjoy a very good run – both in terms of having been able to buy finished cattle well, and through slaughter supply levels and the processing efficiency that that delivers. Some players will no doubt continue to roll the dice on the forward-sell/spot price option, but for people who have had that view for the past 12 months, they have continued to be disappointed, because cattle supply just has not tightened, as many expected it would. Looking back at feeder cattle that went onto feed in December, closing-out for slaughter this week, they were contracted forward by southern Queensland processors at the time at around 590c/kg. That compares with spot price in processor grids this week of 580-590c/kg, meaning little advantage or disadvantage to processors either way.